Teeth whitening products offer a range of results and can sometimes be disappointing. However, the Crest 3D White Classic Vivid Whitestrips (view on Amazon) make getting a consistent and dazzling smile easier than ever. A pearly white smile can make you appear more attractive, healthy and confident. In fact, over 70% of people believe that it can be a deciding factor in career advancement. The ADA has reported exponential growth in the teeth whitening industry, and it shows no signs of slowing down. Despite being widespread, teeth whitening isn’t without its dangers. It is essential that you do your research to get the safest and best result possible. We’ve done that for you in this Crest 3D White Classic Vivid Whitestrips review. Our verdict: do Crest 3D White Classic Vivid Whitestrips work? Crest 3D White is the most well-known brand in over-the-counter teeth whitening products. The Classic Vivid Whitestrips work in the same way as many other gel-based bleaching products. They deliver peroxide-based bleach to the core of the tooth, removing stains and lightening the overall appearance of the tooth. These types of products work best on yellow stained teeth but can give good results for removing brown stains too. The Classic Vivid Whitestrips deliver exceptional results in a comfortable at-home experience. And they cost around 1/10th of the price of professional whitening treatments. The overwhelming consensus is that these whitestrips are effective, easy to use, and well worth the money. However, they may cause some sensitivity and if you already suffer with sensitive teeth, you may wish to opt for a more gentle product, such as the Crest 3D White Gentle Routine Whitestrips. 1.) 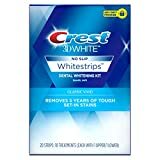 Do Crest 3D White Classic Vivid Whitestrips work? Across the globe, the resounding answer is: yes, they really do work! But aside from anecdotal evidence, it is good to understand why they work. The Classic Vivid whitestrips work in the same way as all of Crest’s other whitening strips. Each strip is a clear strip of plastic coated with a thin layer of gel which contains the bleaching agent hydrogen peroxide. Hydrogen peroxide seeps into the core of the tooth to break up the color inside, making the teeth appear whiter and brighter. This means that the whitestrips can treat both stains on the tooth surface and yellowing which happens from the inside out (view details). Crest’s Advanced Seal and FlexFit technology work together to ensure that every part of your teeth get even coverage and the best whitening possible. At-home whitening always depends on proper use at home, so these patented touches make it easier to get great results at home. 2.) Will Classic Vivid Whitestrips harm my teeth? All Crest 3D White Whitestrips use the same enamel-safe whitening agent that dentists use. You can rest assured that, when used as directed, the whitestrips should do any lasting harm to your teeth. However, as with all whitening products, you may experience some tooth or gum sensitivity. This is especially true when a product offers high levels of whitening, such as the Crest 3D White Classic Vivid Whitestrips. These effects are usually temporary and not harmful. If you already have sensitive teeth, this product is safe to use but is likely to cause some discomfort. Use Crest 3D White Classic Vivid Whitestrips with the expectation that you will temporarily experience heightened sensitivity. Opt for a milder formula especially designed for sensitive teeth, such as the Crest 3D White Gentle Routine Whitestrips. These strips will help to avoid excess side effects, but also may not give as dramatic result. 3.) How soon can I expect results? The Crest 3D White Classic Vivid Whitestrips should be used over a specified time period, not as one off treatments. Whilst visibly whiter teeth can be seen after first use, for full results, use for 30 minutes a day for 10 consecutive days. The Classic Vivid Whistrips can remove up to 5 years of stains from coffee, wine and smoking. These amazing results are achieved utilising Crest 3D White Advanced Seal technology paired with the flexible fit that molds perfectly to your teeth. Both of these work to ensure that you get a full and even coverage resulting in a great smile. If you have especially stained teeth, you may require additional strips to achieve your desired results. Smoking stains are some of the hardest to lift, but Classic Vivid Whitestrips are the best for the job. Additionally, gray stained teeth often do not bleach that well, especially if the tooth has died. Be aware that whitening products only work for natural teeth. If you have crowns, caps, veneers or fillings, the color of these will not be altered. Follow the instructions closely to achieve the best results, and always rememer to consult your dentist before starting a new treatment. Using the Classic Vivid Whitestrips could not be more simple. The Advanced Seal technology ensures that the strip makes full contact with the tooth surface and means there is no slipping or sliding. Apply the whitestrip by placing the gel side to your teeth, following the gumline. Press the whitestrip into teeth for best results, then tuck any excess under and behind your teeth. Reveal your whiter smile and lightly brush teeth to remove any excess whitening gel. To minimise the risk of irritation, never brush your teeth before using whitestrips. Dry teeth before application for the best hold. Once the whitestrips have been removed, follow up with brushing your teeth gently. How long results last for largely depends on each individual person – diet and oral hygiene are contributing factors. Cigarettes, coffee and red wine are known to be big culprits for staining teeth. If your consumption of these is high, results will not last the maximum amount of time. If you don’t indulge in these, you can expect your results to last at least 4-6 months, if not more. Some users report results for as long as 12 months! Whilst there is no hard and fast rule for how long your results will last, Crest 3D White do guarantee a brighter, whiter smile for at least 2 months. Rinsing with water is a powerful tool and it can be great at preventing staining. If you just can’t resist that glass of red wine, simply rinse your mouth with water immediately after to prevent stains from settling in. Not every product is the perfect fit for everyone, and we suggest speaking with your dentist to find the best fit for you. If you are concerned that the Classic Vivid whitestrips might not be best for you, alternatives are available. For sensitive teeth, we recommend: Crest 3D White Gentle Routine Whitestrips. These are also from the Crest 3D range but have a lower peroxide concentration to minimise sensitivity as much as possible. For extremely crooked teeth, we recommend: Opalescence Go gel and mouth tray. While gels are a little less tidy to use, the nature of the kit allows the gel to seep around and in between teeth ensuring that even the tightest of areas are covered. That said, Crest 3D White Classic Vivid Whitestrips are great fit for many people due to their FlexFit technology. Vivid Plus pack – 12 pack of Classic Vivid whitestrips and 2 treatments of 1 Hour Express whitestrips for touch ups. Crest 3D White promises results, and they deliver with their Classic Vivid Whitestrips. The treatment time is minimal and so is the price. In fact, the only thing that seems huge is the result! If you’re looking for a comfortable and easy at-home routine that’s effective without breaking the bank, then Crest 3D White Classic Vivid Whitestrips are for you. To get even more value for money, opt for the Crest 3D White Vivid Plus pack. It contains two 1 Hour Express Whitestrips which are perfect when you need great results fast. Do Crest 3D White Classic Vivid Whitestrips work on crooked teeth? While best results are gained from straight teeth, great results can be seen on crooked teeth as well. Take care when placing the whitestrip, ensuring that you press the whitestrip tightly around all surfaces of the tooth. A toothpick can help with this. Even if some areas aren’t covered every day, this typically evens out of the treatment course as it is rare to miss exactly the same spot every day. If you are still concered that whitestrips might not be able to provide adequate whitening for you, you could opt for a gel whitening kit with mouth tray which allows the whitening gel to seep around and between the teeth. No – Crest whitestrips are tasteless and no alternative flavors are available. Can the whitestrips be used twice daily to speed up the whitening process? The Classic Vivid whitestrips should only be used once daily as directed. Hydrogen peroxide is a strong bleaching agent and using the whitestrips more than advised can result in excessive tooth sensitivity, gum irritation, and even permanent tooth damamge. Are Crest 3D White Classic Vivid Whitestrips suitable for children? There is not specific age but whitestrips are only suitable for use on adult teeth. A child typically develops an almost full set of adult teeth around 13 years old. If you are unsure whether your child has all their adult teeth, we advise that you consult their dentist before proceeding with treatment. Should the whitestrips be used alongside a specialist toothpaste? It is not essential to use a specialist toothpaste alongside whitestrips, but it can be helpful. Those with sensitive teeth can help to minimise sensitivity by opting for a high fluoride numbing toothpaste. This helps to strengthen the enamel, while blocking the signals from the nerves to the brain. A whitening toothpaste can also be used to help prevent the build up of stains. Is this a permanent whitening solution? As tooth staining is a daily occurence, no whitening solution will ever be permanent. For sustained results, continue to use intermitently as needed. Do the strips need molding? No – whitestrips are a flexible strip that fits around your teeth. They do not need to be molded first. What percentage peroxide are Classic Vivid Whitestrips? The Classic Vivid whitestrips are 10% hydrogen peroxide (which is equivalent to 29% carbamide peroxide). This concentration is not uncommon but still fairly strong, and perhaps not suitable for sensitive teeth. Can I drink coffee while using the whitestrips? Advance Seal technology means that the whitestrips should stay put through talking and drinking. However, teeth are more susceptible to staining during the bleaching process so it is best to avoid drinks like coffee if possible. If you really can’t resist that cup of coffee, rinse your mouth out water immediately after to prevent the stains from setting in. Do the Crest 3D White Classic Vivid Whiestrips work on yellow teeth? Yes – yellow teeth are the perfect candidate for teeth whitening strips. This is because yellowing is caused by the aging of the tooth at the core. The bleaching agent seeps into the teeth and breaks up the color compouds inside. However, whitestrips are not very effective on gray teeth which often need professional treatments. Crest 3D White Glamorous White Whitestrips: Are They Worth It?